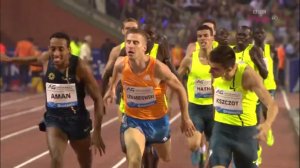 The Brussels Diamond League meet on Friday brought to the end the 2014 Diamond League season in grand style. $40,000 was on the line for each of the Diamond League champions. In the sprints, Justin Gatlin pulled off the greatest fastest 100-200 one day double ever in the sport, in the steeple American Evan Jager broke the American record as Jairus Birech broke 8:00 for the first time, in the 1500 Taoufik Makhloufi got the win after celebrating too soon, and in the 800 Brenda Martinez got the huge win. We recap all of those stories separately at the links above. 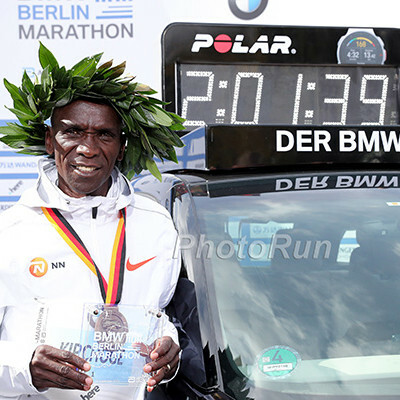 Below we recap everything else including the women’s 3000m finale and the incredible high jump. 1500 specialists like Sifan Hassan and Jenny Simpson were in the mix, actually in first and second with 200 to go, but the woman with the best kick over the final 200 was Kenya’s Mercy Cherono, the 2014 Commonwealth Games champ at 5k and 2013 Worlds 5000 silver medallist, who got the win in 8:28.95 after a 60ish last lap (sub 30 last 200). 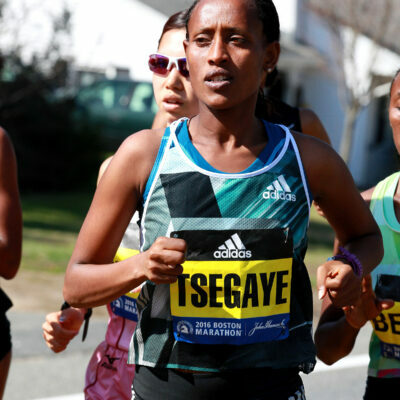 With the win, Cherono won $50,000 ($10,000 for the win and $40,000 for the season title) as she needed just to be Genzebe Dibaba in this race to win the season title. Dibaba fought all the way to the line for the money but ended up third in 8:29.41, just behind Hassan who was second in 8:29.38. The grudge match between American 1500 runners Jenny Simpson and Shannon Rowbury ended up being very tight once again. In the end, Simpson prevailed in fourth in 8:29.58 – the second fastest time ever run by an American, a mark only eclipsed by the drug cheat Mary Slaney’s American record of8:25.83. Rowbury had a nice consolation prize, however, as she was fifth in 8:29.93, making her just the third woman in US history to go under 8:30. Rowbury had come in as the #2 American all-time at 8:31.38. Quick Thought #1: This race is proof that kicks dont’ come down to who is the fastest, but rather who has the most left at the end. 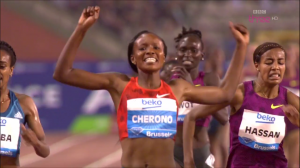 Cherono has a 4:02.31 1500 pb yet she was the race winner. Quick Thought #2: That’s great running by the two Americans. They were very close last week in Zurich and very close today. Rowbury stalked behind Simpson nearly the entire race, but just couldn’t catch her the final 100m. A tense rivalry between these two is good for the sport. European 800 champ Adam Kszczot of Poland got the win in an entertaining non-DL 1000, holding off 2013 world 800 champ Mo Aman of Ethiopia and fellow Pole Marcin Lewandowski to win in 2:15.72. Aman was second in 2:15.75, while Lewandowski was third in 2:15.79 in a blanket finish. Kszczot and Aman both set national records in the rarely-run event. 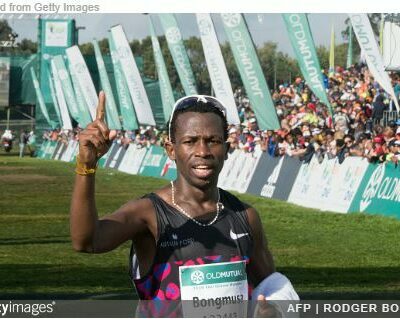 Rabbit Bram Som got out quickly and the only man to follow him was 21-year-old Kenyan Anthony Chemut. By 200 meters, they had a gap of about 8 meters on Kszczot and Lewandowski, who in turn had about 5 meters on the rest of the field. As Som led Chemut through 400 in 52.40, their lead remained large as Kszczot and Lewandowski had faded back to the main pack. Universal Sports announcer Stuart Storey didn’t seem surprised as he believed Chemut was another rabbit, but as the race went on it became apparent to him and his partner Tim Hutchings that Chemut had every intention of finishing the race. Chemut hasn’t rabbitted any races in the past so it’s pretty clear that he ran with Som because it was his race strategy and not because he was a rabbit. Som dropped out at 600 meters and Chemut had a big lead which we timed at 1.3 seconds. 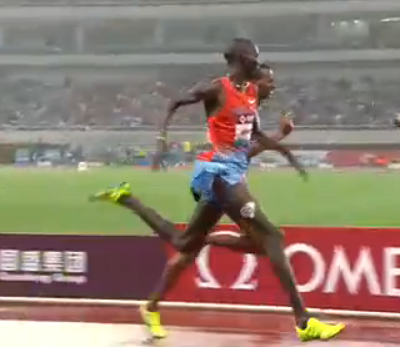 The gap was 7 meters with 300 to go and it was starting to look like Chemut might actually be able to pull it off. Kszczot and Lewandowski realized they had to pick it up if they were going to catch Chemut and they accelerated rapidly over the back stretch, passing him with 200 to go (they hit 800 in 1:48.87, with Chemut barely in front). Aman joined them over the final turn and as they hit the home stretch, those three had a big gap on the rest of the field. All three refused to cede ground over the final 100 and they ran three abreast all the way to the finish line. Aman looked as if he was going to move by on the outside several times, but he could never quite get by as Kszczot held on for the win on the inside by .03. As for Chemut, he’s probably regretting going with Som right now as he had absolutely nothing left once he was passed, going from first with last in the 12-man field over the final 200 meters. The men’s high jump has been one of the top events all year long so it was only fitting that Barshim saved his best for last. Both Barshim and 2013 World champ Bohdan Bondarenko cleared 2.40 meters, but Bondarenko was ahead on count backs. With no one else left in the field, whoever won today would also win the Diamond League title. Barshim cleared 2.43 on his first attempt which gave him the lead (after Bondarenko missed his first attempt) and sole possession of second place on the all-time list (previously he, Bondarenko and Patrick Sjoberg were tied at 2.42). The only way Bondarenko could win now would be to clear the next height before Barshim. The only problem for both of them was the next height was a new world record of 2.46. Barshim took some good jumps at 2.46 but missed all three. Bondarenko missed both of his attempts at the world record and had to settle for second in the meet and the Diamond Race. To put it into context for American fans, 2.43 meters is 7’11.75” and it’s tied for the third-highest jump in history. The high jump is incredibly deep this year, as five men have cleared 2.40, but Barshim and Bondarenko have clearly been the best of the best as they’ve each won three DL events and own 14 of the top 18 jumps on the year. They both took several jumps at the world record this year and it looks like it’s only a matter of time until one of them surpasses Javier Sotomayor’s 2.45 world record from 1993. Sanya Richards-Ross went out hard and had a huge lead at 350 and managed to hold on in the closing meters as she won in 49.98, her second sub-50 showing of the year. Finishing second was the Commonwealth Games champ Stephenie Ann McPherson in a season’s best 50.12. The third-placer was the DL champ, Novlene Williams-Mills, who had the DL title wrapped up coming in. Williams-Mills, who got the silver at Commonwealths, won the DL title without breaking 50.00 all season but got wins in Shanghai, Eugene, Oslo, and Stockholm. 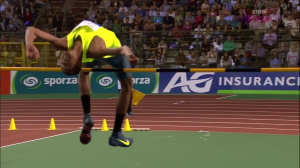 France’s Pascal Martinot-Lagarde had the DL title wrapped up coming in but he got the win anyway in 13.08. World record holder Aries Merritt, who has struggled all year, was only 7th in 13.37 but that’s actually his best time of the season in Europe this year (previous best 13.39). 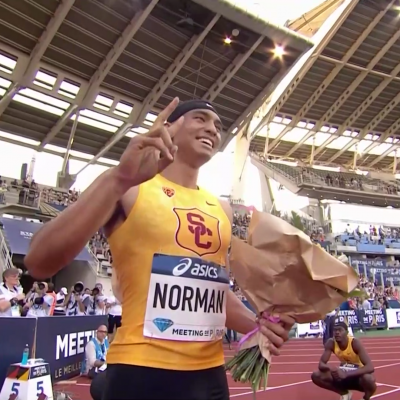 He did run 13.27 in Eugene, but not at Pre. Allyson Felix held on in the home stretch to run a world leader of 22.02 and reclaim the Diamond League title (she previously won in 2010). Felix hasn’t looked great in the 100 this year (she was 7th in Zurich and didn’t even make the final in Birmingham), but she’s looked strong in the 200, with wins in Oslo, Stockholm and now Brussels. Kaliese Spencer continued her spectacular season with the win. She’d already had the DL title locked up as she has been unbeatable since the end of May. Kaliese opened her 400m hurdle season with a second place finish in Doha. Since then, counting tonight, she is undefeated with nine straight wins including the Commonwealth title. She’s an inspiration. 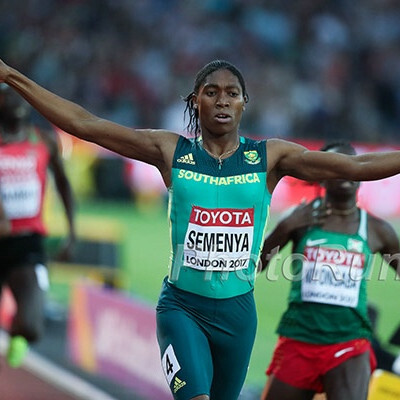 4th at Worlds/Olympics in 2009, 2011 and 2012, she got DQ’d in two events (4×400 and 400m hurdles) at Worlds in 2013 but has won everything in sight this year except for the season opener in Doha. Harting’s throw of 67.57 was 22 centimeters better than Malachowski, but Malachowski only needed to get second to clinch the Diamond Race and that’s exactly what he did. Harting, who has won the last four global championships, won four of the seven DL events, but Malachowski won three and got second in the remaining four, which gave him enough points to overcome Harting. Colombia’s Caterine Ibarguen had already locked up the DL title entering the meet, but she won today as well, leaping 14.98m on her final jump to complete her second consecutive undefeated season and extend her winning streak to 19. Double Olympic champ Spotakova clinched the DL title with a world-leading toss of 67.99 meters. Valerie Adams continued her dominance by getting her 56th straight victory and the Diamond League title. Adams hasn’t lost in over 4 years. The crazy thing is she’s barely over half-way to Edwin Moses’ amazing 107 straight wins in the 400m hurdles. Lavillenie no-heighted in bad vaulting conditions in Stockholm, but he was back to his best today as he threw down an outdoor world-leading mark of 5.93 to win comfortably (he had already clinched the Diamond Race). Lavillenie dominated the Diamond League once again in 2014 (he’s now won all five editions of the Diamond Race) but it was a little disappointing that he was only able to reach 5.93 meters outdoors after setting the world record at 6.16 indoors in February. Mokoena only scored points at one other DL event this year (he won in Stockholm) and that, coupled with his win in Brussels, was enough to secure the DL title. Mokoena, the 2008 Olympic silver medallist, jumped a 10-centimeter SB today of 8.19, giving him the win over the Netherlands’ Ignisious Gaisah. The U.S.’s Jeff Henderson, who led the DL standings coming in, did not compete in Brussels due to injury.